Have these site news updates sent directly to an RSS reader or straight into your email inbox. This is different from Sarah's Newsletter and requires a separate sign-up. I’m okay! But imagine my surprise…We had no clue Hurricane Irma went directly over our gated community in Bonita Springs until it was in the NYT today. Naturally, the path of the storm must have been reported everywhere, but we just got power back at 3:45am this morning, so we’ve virtually been in a media blackout/intermittent cell service for days. Our home when we drove away. 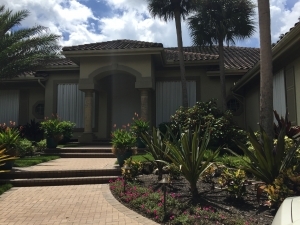 My husband, 2 Pomeranians and I boarded up our home and bunked with romance writer, (C. F. Francis) and her husband in a home he manages in Lehigh Acres, the highest elevation in SWFL. The eye of Irma passed over there as well! The whole day was definitely a terrifying ordeal, but we all made it without any structural damage or storm surge to that house or both of our own. I’ve posted pictures and videos on my Facebook pages. When the power went back on this morning, I was up anyway, reading a novel by flashlight. Guess what I immediately did? Yep, cranked up my coffee machine for the first time in three days! I’m fine, and I am so grateful for all the thoughts, texts and well wishes! I’m also very aware of those who did not fare well, in both SWFL and my hometown of 20 years, Houston. Help Authors to Help Houston! From Sept 4th to 17th, these authors have pledged to donate ALL royalties to Houston Harvey Relief. As most of you know, Houston was my home for 20 years and it’s been horrifying and helpless to see familiar neighborhoods ravaged under so much water. I’m still a member of two Romance Writers of America chapters there, and am happy to report everyone except one member made it through with minimal damage. Sadly, the one member lost 95% of everything she owns and our chapter has kicked into high gear to help her and the city. 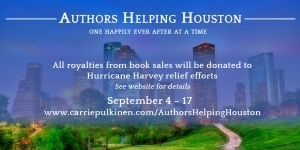 In that spirit Carrie Pulkinen established this page for readers to buy books from authors willing to donate all royalties to Houston charities these next two weeks. Please take a look at the books up for sale, including Tall, Dark and Damaged and Capturing the Queen. We appreciate all purchases, shares and retweets. Happy reading! Capturing the Queen is .99 cents! Wow, 99 cents! What else can you buy for less than a dollar? That’s right, I’ve slashed the price for digital copies of Capturing the Queen, my Damaged Heroes, Book Two. Hope you buy your copy today! Sale ends on Labor Day, so please pass the word! “Five stars just aren’t enough for this intriguing, suspenseful story! I’m thrilled readers love this story of a Beauty and a Geek ensnared in black market artifact smuggling and lone wolf terrorism in the heart of Chicago. Inside Secrets into my next novel! Thank you to everyone who emailed me after watching the live streamed RWA RITA Awards! 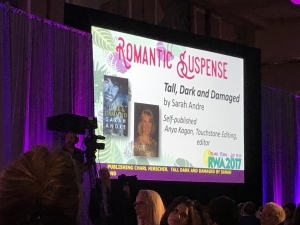 The talented Elizabeth Naughton won the romantic suspense award, but just seeing my name and Tall, Dark and Damaged on the Jumbo-tron gave me goosebumps! Another highlight was being greeted by other romance writers with, “Oh my gosh, are you Sarah Andre?” Wow! A glimpse of what it’s like to be famous! If you haven’t had a chance to pick up this modern-day Gothic romantic suspense, this is your chance! It’s Book One in my Damaged Heroes series. And after a tremendous launch of Book Two, Capturing the Queen in June and that fabulous week in Orlando, I have officially begun the next novel! Romance Writers of America holds their annual conference in Orlando this year and YOU can be a part of it! The RITA Awards (our version of the Oscars) will be held Thurs, July 27th, 7-9pm EST. HUGE NEWS: The entire ceremony will be live-streamed! That’s right, you can have a front row seat to see your favorite authors all glammed up and find out who wins the 2017 awards for writing excellence. Click this official website that evening to see it all live: RWA website. As you know Tall, Dark and Damaged is up for a RITA in Romantic Suspense and I’d love for you to be there sharing the moment with me! Also: have you signed up to receive my newsletter? I sent this out yesterday–hurry, the contest at the bottom of the page ends tomorrow. I’m getting ready for the annual Romance Writers of America conference, so this will be the last giveaway for awhile. 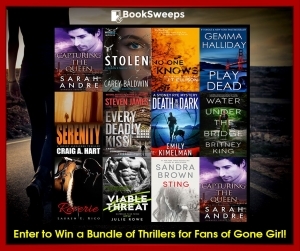 All this week Capturing the Queen is part of a mega giveaway; ten romantic thriller novels from some exceptional authors (look at these names!!) and your choice of a Kindle Fire or Nook. No purchase necessary, click here to enter. Best of luck! Don’t feel too much like working today? Me neither! Here’s a quick diversion: Lorelei’s Lit Lair asked me 8 fun questions and posted my answers on her blog. Stop by and say hi for a chance to win a copy of Tall, Dark and Damaged. Click here during your next coffee break: Author Spotlight & Giveaway: Sarah Andre! New Capturing the Queen Giveaway! If you haven’t grabbed your copy of Capturing the Queen, now is your lucky chance. Click here to enter my Goodreads Giveaway. I’m giving away 10 signed paperbacks from now until July 6th! Please help me spread the word, and please don’t forget to leave a review when you’re finished! A digital copy of Capturing the Queen goes to: Jane G, Ardon B, Dianne P, Jodi CM, Lori Bird, Bev F, Zara W, Candy B, Jennifer R, and Judy T.
A Capturing the Queen mug with a $10 Starbucks gift card gets sent to: Joyce G, Rhonda P, Lily O, Christiana T and Barbara C.
And the fabulous $240 worth of Nerium Products goes to: Dawn S.
Congratulations, everybody! I’ll be contacting each of you individually to reconfirm emails or addresses. Check back for next week’s contest link; I have a Goodreads Giveaway beginning next Wednesday, June 28th! Just Ended. Stop back for a Goodreads Giveaway tomorrow. This BookSweeps giveaway ends soon! If you haven’t already entered, don’t miss your chance to win a mega-bundle of mystery and thriller novels, twelve bookstore gift cards, a Kindle Fire or Nook Tablet. Two chances to win: Follow any of these authors on Amazon or BookBub and you’re in the running. I’m giving away a copy of Tall, Dark and Damaged, my Damaged Heroes, Book One. Good luck! I’m also sponsoring a Rafflecopter giveaway to celebrate the release of Capturing the Queen, my Damaged Heroes, Book Two, by giving away ten digital copies, five mugs with $10 Starbucks gift cards and a gift basket of Nerium products worth over $240! Contest ends at midnight on June 22nd. I’ll announce the winners on this home page. Sarah's newsletter is for big announcments, like book releases, while site news keeps you up to date with everything going on in the world of Sarah Andre. Sign up for whichever kind of news you want, or both!